We had fun at the Tampa Greenfest Event this past weekend, and even though we got some much needed rain pouring down on us Sunday morning, the crowds still came out. The new plant, the "Joey" is really making the rounds with more vendors carrying it. 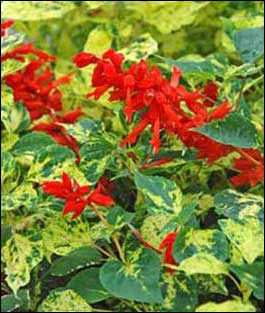 The pic here is of "Dancing Flame" Salvia, a gorgeous hybrid, which we were are encouraging for spring and summer gardens and will be carrying it. Just a note, Mitch was able to find 4 gorgeous braided "Ficus Ali" plants. They are in 3 gallon pots and will plant out at 5 ft and are gorgeous specimens. We have had several requests in the past for this, so let us know as they will go fast. Have a great week and let's hope for some more much need rain!